Michael Haneke is one of the most prominent names in the world cinema. Every film by him has such a lure for the viewers as honey does for the bees. His “Amour” (2012), “The White Ribbon” (2009), and many other critically acclaimed pieces are rare treasures that an appreciating viewer would want to keep in a museum to preserve for the generations to come. His recent film “Happy End” shows another approach to picture the life of a bourgeois family with all the ups and downs they go through in search of their own happy ending. Everyone might interpret the story differently, but one thing we all know for sure: when the trouble strikes, it does not check one’s bank account to see how much money they have. The trouble strikes whenever it wishes or whenever it finds a family that fits into its demands. As it appears in “Happy End”, the Laurent family is a real role model for that case. During the Toronto International Film Festival, I had an amazing opportunity to meet Michael Haneke. He generously agreed to discuss “Happy End” during a round table interview at the Intercontinental Hotel of glorious Toronto and give us a deeper understanding of the film. MOVIEMOVESME: “Happy End” is a drama. Yet, there is a very interesting sense of humour that takes us through the whole story as we learn about the Laurent family. I would like to know why you have chosen that approach? Michael Haneke: I think that humour is more appropriate to the story. I wanted to tell a story about a family that is perhaps not as entirely happy. Their lives aren’t as happy as they wish for themselves. Nonetheless, it doesn’t turn the film into a drama. I think what they’re going through is actually quite desirable. It’s a farce, and the way that we take ourselves so seriously here in the first world, the way that we’re so involved with our tiny aches and pains. In fact, that’s quite ridiculous and awkward. Tragedies don’t occur in the first world. They only take place in the third world. MOVIEMOVESME: In certain parts of the film it is hard to understand who is actually experiencing those things through the media. For instance, the affair that is happening through email. I wonder whether it is done intentionally? Michael Haneke: That is really how life is, and how we experience life. It’s fragmentary. We enter a room and we first meet a person. We don’t know the entire story, we only catch a glimpse of it, and we’re always trying to make sense of those fragments. There’s this contradictory element – we glimpse fragments and those fragments are often contradictory, and that makes the world a much richer, more interesting and exciting place. It’s only in mainstream cinema – in the escapist cinema, that everything is explained, or every aspect of the film is immediately understandable. That’s ridiculous and false, and treats the audience as dumb. It is also boring. I’m more interested when I have to find explanations for myself than when I’m force fed. MOVIEMOVESME: Towards the end of the film, Jean-Louis Trintignant’s character – George Laurent – tells this story that is very similar to the events of Jorge. Do you consider this to be a continuation of that character, or is it just a story you’re revisiting? 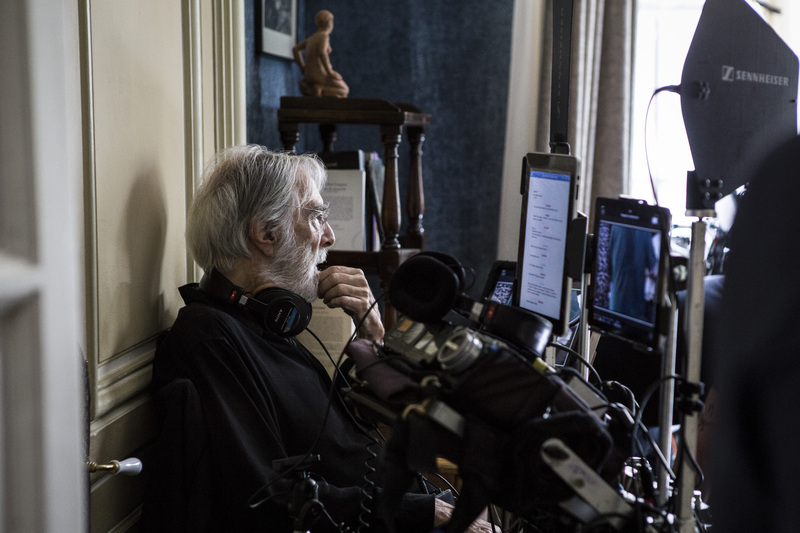 Michael Haneke: I don’t see the film as a continuation of “Amour”. It deals with a situation that draws on a personal experience of mine which moved me a great deal. An aunt of mine, who was an extremely close person to me, wanted to commit a suicide at the end of her life. That made me want to deal with that story in “Amour”. This isn’t a continuation, it’s the ending of “Amour”. However, it was a metaphorical ending. We didn’t know what really happened to the character of Jean-Louis, and I wanted to present a different variation of the same situation. This time, present a realistic version that was believable. The main reason, however, that I went back to this is the desire on my part to work again with Jean-Louis Trintignant. Thus, I created a similar situation for him. MOVIEMOVESME: I think the most unpredictable and at the same time the most intelligent character in the film is the little girl. She’s the one who watches them through her phone, recording. In the end, she actually starts videotaping when her grandfather wants to commit a suicide. That’s her way of seeing the happy end, I would say. I would like to ask you to tell us about that. Michael Haneke: Every deprivation is right. When the film is on the screen, everybody sees it in their own way – their own film. And he is right, or she is right. I do not want my tell my own interpretation of the film. MOVIEMOVESME: If I am not mistaken, this is your fourth film with Isabelle Huppert. I think that her sensibilities as an actress and your sensibility as a director go so amazingly well together. Could you please talk a bit more about your professional relationship? Michael Haneke: It’s exactly as you described it. There is such a level of complete understanding between us. We get along so well together. Also, when I was making my German language films, there were several actors who I worked with repeatedly because I got along with them so well. It makes things easier when you’re working with them the second time or afterwards. Then you don’t have to start over again. You know how each person works and they know what to expect. Also, as I mentioned in other interviews, if you know an actor, then you know their strengths and weaknesses and you can write for them. It makes it easier to obtain what you want. It also means that you don’t have to spend so much time talking. When Isabelle shows up on set, she’s read the script, she comes to the set and she plays her part. Then you may ask for a few adjustments, but more or less she’s done the work. It’s very easy and also very pleasant, and she’s a great actress. It’s true that sometimes you have actors who are wonderful, but with whom it’s not quite as effortless, that you have to work again and again to obtain with them what you want. You have the impression that they live on an entirely different planet that’s more effortful. Working with Jean-Louis is effortless as well. MOVIEMOVESME: What is your approach toward the actors, and how much you allow them to improvise or have freedom on the set? Michael Haneke: It’s really a question of trust. You have to create trust with your actors. It’s what I tell my students at the Film Academy when I teach directing. It is the most important thing when you’re working with actors – to give them a sense of confidence. If you tell them twice in a row things that are absolutely stupid, that don’t help them on set, then the relationship is gone forever. You can’t repair that. If you can make the right comment at the right time, that’s helpful. It builds the sense of trust in them. It’s important to love them, to really love your actors, because they can feel that. Once they feel loved, once you establish that climate of trust, then they’re able to give you what you need. At the same time, you have to be able to judge them. You love them but you have to judge them as well, and be able to explain to them what you want. There’s no recipe, unfortunately. There’s no one size that fits everyone or gives all answers. You have to work with each actor differently. If there was one single recipe, then you’d never see a bad performance in movie. During casting, you try to find the right actor for the right part. You can be the best director in the world, have the best script and the best actors, but if they’re not the best actor for that part then you’ll never come up with anything. Certainly, with Isabelle, she’s a wonderful actress, but you have to choose the right part for her. Otherwise, she too, would give a bad performance.